Shown $29.99Flowers are designed to be delivered as close to the arrangement pictured as possible. 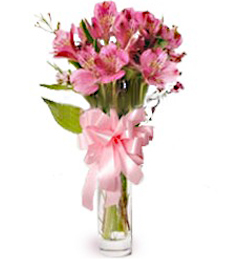 Deluxe $39.99We'll add additional flowers that will coordinate with the arrangement in both style and color. Pretty pink petals pop with color and vibrance from this delicate, yet bold, medley of flowers. What a wonderful way to spoil someone you love with all your heart!